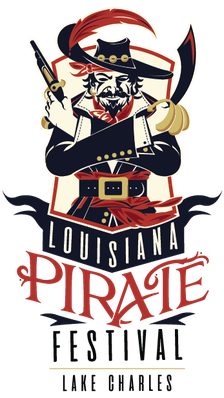 Rules & Regulations - Louisiana Pirate Festival in Lake Charles! Anyone consuming alcoholic beverages on the L.C. Civic Center grounds must have a valid State Driver’s License, ID or Military ID, with photo and must be at least 21 years of age. All events take place on the Lake Charles Civic Center grounds, unless otherwise noted. Boat docking on the Civic Center seawall or steps will be at your own risk. The City of Lake Charles and Louisiana Pirate Festival, Inc. are not responsible for boat docking or any damage to boats. Pirate landing boats will have a designated spot on the seawall. All others will be first come, first served. There is no saving of spots. No ice chests, beverage coolers or pets are allowed on the grounds during open hours of the festival. No glass bottles or alcohol are allowed on Civic Center grounds. Boats will stern in or beam in (sideways). If beam in, boaters must allow other vessels to raft off. Allow 10 feet per boat length to let raft up to side. Example: 30-foot boat = 3 boats. People climbing on or off seawall or loading and unloading do so at their own risk. Law Enforcement will patrol the seawall. When the seawall is cleared for a Louisiana Pirate Festival water event, any unoccupied boat will be towed and anchored. The owner must notify Marine Enforcement for location. Music is a pleasure of your boat only… Loud music laws will be enforced. Dancing on seawall or steps is discouraged due to risk or injury. (Dancing is allowed on grassy areas). There is no swimming off boats at seawall or around anchored boats. A no wake zone is enforced inside boat anchored (parking) areas as per City Ordinance. An “idle lane” is marked off for boat travel through anchored boats along seawall. No anchoring or sailboats can run under sail in the idle lane. Use clutch idle speed only. All DUI, drug and marine laws will be enforced. VHF Channel 68 will be used for Louisiana Pirate Festival events.